I have a soft spot for SK; it’s been amateurish at times but gone are the days of Antony Worrall Thompson (and Greg Wallace who I have no recollection of) and it’s great, bleary-eyed viewing with a cuppa and slice of toast. Every time Roux senior appears on the show, James’ reverence warms my cockles but a guest who was most unbecoming was Madhur Jaffrey. I recall that she was very unhappy at our host’s attempts at onion slicing and purposefully took 3 minutes to cook an omelette. How egg-ravating. 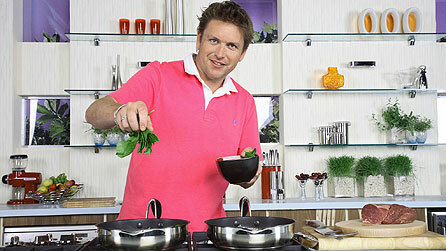 A while ago, during one of James’ breaks, regular guest John Torode took over. This may be the only time I have actually watched television through my fingers such was the level of embarrassment. I remember issues with the autocue and by the end of the show he muttered something about it ‘all going to pot’ and ‘what a bloody nightmare’ whilst downing the bottle of red. Poor fella. Still, I think he’s doing alright for himself now. As a beer widow I often hear tutting in response to the wine expert’s choice of tipple. “How about a nice wheat beer, eh?” I believe the internet is all a twitter over what beverage should be chosen to accompany Michael Ball’s pork belly or Celia Imrie’s dreaded battenburg. Many minutes go by as I think of my own food heaven, such a long list. Lamb? AUBERGINE!! Courgette? Oh, mackerel – that’s the fella! OK, mackerel but I’ve got to have garlic in there too. Hell is way too easy, olives and coffee of course. I’d like the celebrity guests to chose their actual food hell – nut allergy? If the public don’t like you, let them put you in hospital. Lactose intolerant? Give the C-Lister a stomach complaint or two. Go on, I’m sure Denise Lewis wouldn’t mind. Or as Pierre has it, “bourgee”. Well, everyone seems to fixated with vacuuming & sous vide but I couldn’t see the benefit of vacuuming this fella. I reckon you could stick it in the freezer in a bag no problem. Could you also use a mandolin on v thin setting? I can’t watch people use those – visions of blood everywhere & a fingertip in your tea [shudder]. I thought Pierre might come a cropper with the slicing but I’m sure he’s used more slicers than I’ve had hot dinners [makes reservation at Koffmanns]. WOOOO! Pierre Koffmann is back back back! Tomorrow’s show (22/09/12) will also feature Bryn Williams. Cannot wait.